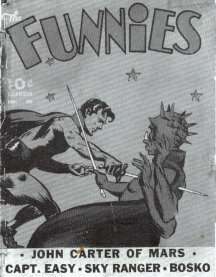 THE FUNNIES This Dell series ran from issue 1 (October 1936) thru 64 (May 1942). 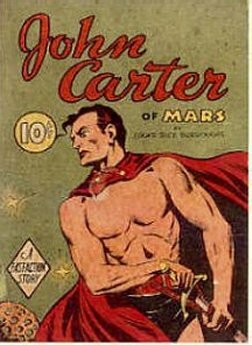 John Carter's first appearance in comic format was in The Funnies Issue #30, May 1939 -- Issue #56, June, 1941. 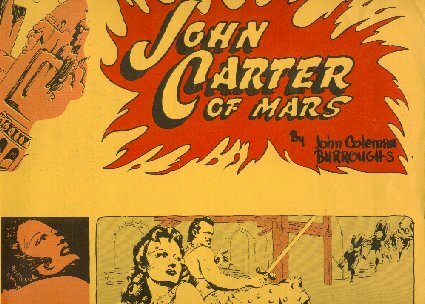 Most of the art was by John Coleman Burroughs Issues 35, 36, 37, 40 and 42 had John Carter of Mars covers. 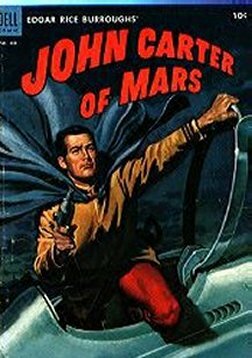 #30: May, 1939 - 4 pages of JC by an unknown author. 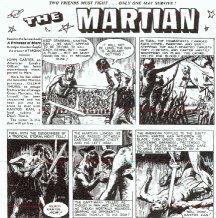 #57: July, 1941 - The promised JC story, "The Green Men Again!" does not appear. 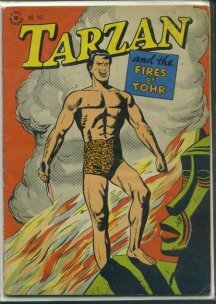 It was adapted and drawn by John Coleman Burroughs. 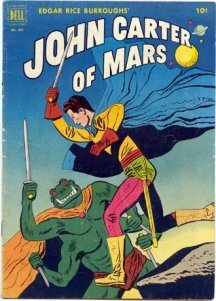 John Carter's second comic appearance. 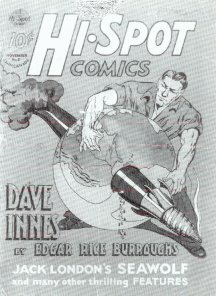 95 b&w interior illustrations reproduced from The Funnies nos. 30-39. 209 b&w interior illustrations by John Coleman Burroughs Many of the illustrations are reproductions of panels drawn for The Funnies. 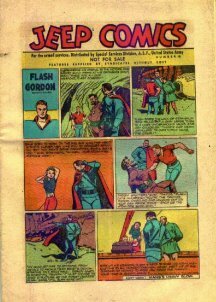 United Feature Syndicate - December 7, 1941 thru April 3, 1943 ~ 69 nine-panel strips - Some are adapted from The Funnies. 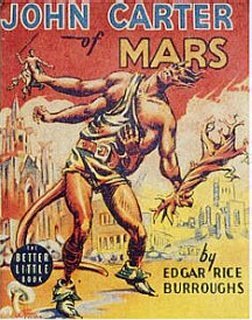 The strip was written by JCB (some of the material was based on ERB stories) and illustrated by JCB. After the first 10 weeks the strip features new original story lines. 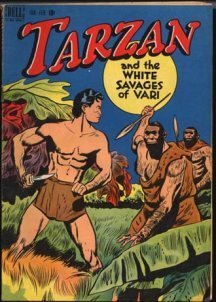 ERB possibly discontinued involvement with the strip because of his duties as a war correspondent in the Pacific. 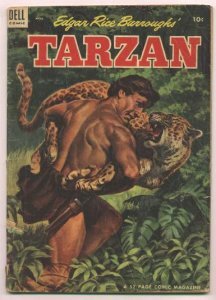 The series was reprinted in an oversized, b/w House of Greystoke publication in the early '70s. 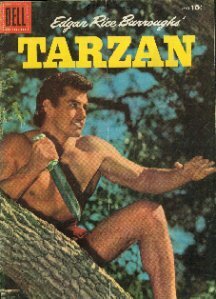 The strips were reprinted by Dark Horse with their Tarzan: The Lost Adventure trade paperback series of 4. 1-13, 14T, 15-20, 21T, 22-24, 25T, 26, 27, 28T, 29, 30, 31T, 32, 33, 34T, 35, 36, 37T, 38-41, 42T, 43, 44T, 45, 46, 47T, 48, 49, 50T, 51, 52, 53T, 54-82, 83T, 84-86, 90-92. Jesse Marsh art - Adaptations of PM, GM & WM. 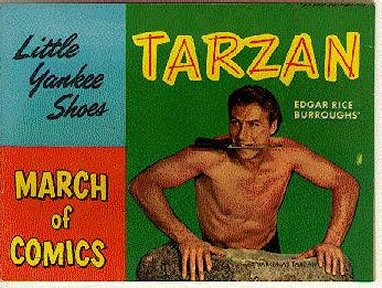 #437: November, 1952 - "The Black Pirates of Omean"
#488: 1953 - "Tyrant of the North"
MARCH OF COMICS: TARZAN This series of Tarzan comics first appeared in 1952 as a give-away item from shoe stores. 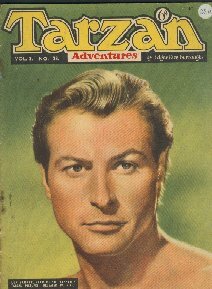 The first seven issues were 32 pages and the last twelve were 16 pages long. 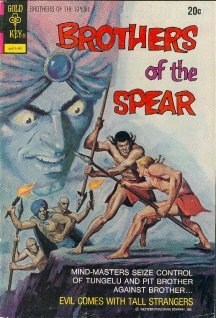 The first eight issues were 5 1/8 h x 7 1/4w and the rest were 5 1/8w x 7 1/4h. 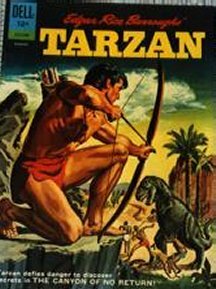 Volume 1 Nos 1-22 ~ Volume 2 Nos 1-36 ~ Volume 3 Nos 1-52 ~ Volume 4 Nos 1-52 ~ Volume 5 Nos.1-52 ~ Volume 6 Nos 1-52 ~ Volume 7 Nos 1-52 ~ Volume 8 Nos 1-52 ~ Volume 9 (1959) Nos 1-32. 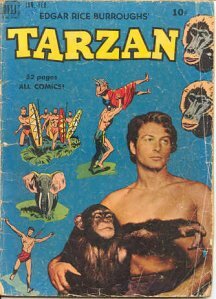 Tarzan Comic published monthly by Dell starting in January 1948. Mostly Jesse Marsh art. 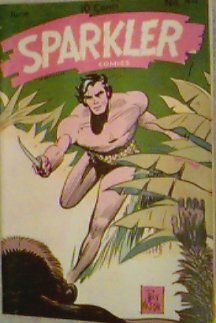 The series also featured a long-running popular serial: Brothers of the Spear, beautifullly drawn by future Tarzan artist Russ Manning. 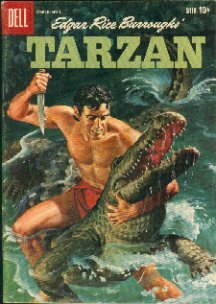 It was later spun off for a short-lived GK series of its own. 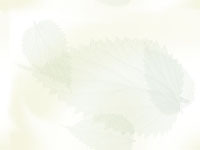 Revisions and updates to this compilation are encouraged.